We strive through our service to achieve more than the goal of each individual project. By working together in our clubs, districts, and internationally we strive to establish the foundations of a better society - friendship, trust, honesty, and hope. 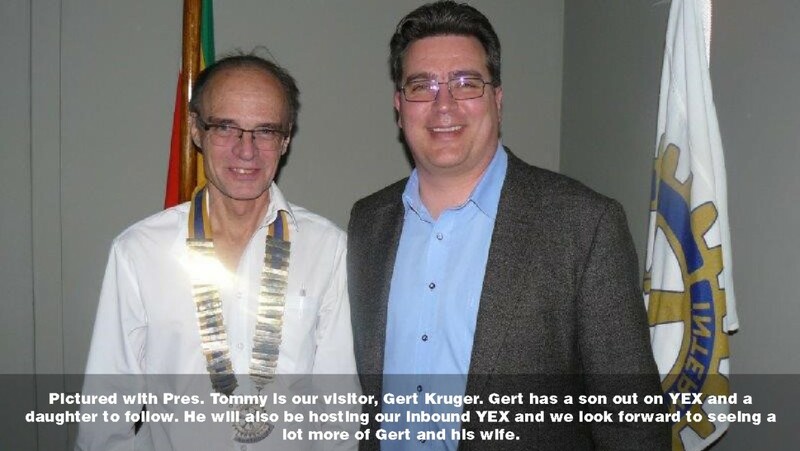 The Rotary Club of Northcliff was chartered on 16 May 1973 and has currently 25 members! The new board members to serve in the Rotary year 1 July to 30 June 2018. Weekly Dinner Meetings take place at the Randpark Club. For more information view our contact section. Zorba Miltiado, our local Pick ‘n Pay Owner/Manager will be retiring at the end of year after being involved in the family business for over 45 years. He has been the Manager of the Pick ‘n Pay Northcliff Square for 18 years and believes it’s time the younger generation to take over the reins. For those who did not know Zorba, he together with his family emigrated from Cyprus in 1965. In 1969, Zorba matriculated from Parktown Boys and went on to study mining engineering at Wits. He has been involved in the retail business since 1973. Many residents and shoppers would know that Zorba spends his free time creating brilliant furniture from old tree trunks which was proudly displayed and used in the store. As a farewell gift, he has decided to donate his latest piece of art to the Rotary Club of Northcliff which he is a keen supporter of over many years. The table is made from the trunk of a pepper tree and has taken him over a year to complete. The club is involved in many community projects both locally and nationally with the latest completed project being the redevelopment of Northcliff Ridge pathways at the water tower. Members of the Club receiving the table from Zorba. Side view coffee table on grass. The all-weather table with glow in the dark pigmentation. The completed table 1.70m x 0,65m high. The club will be auctioning this masterpiece via its website on www.northcliffrotary.co.za , use the contact us tab and leave your details and bid on the enquiry block. There will be post on the “I Love Northcliff” facebook page. We are therefore calling on all interested bidders, art collectors and interior decorators to place your bids which has a minimum reserve price of R 10,000. The funds raised will be used on the various community projects that the club is involved in. When asked what he is most looking forward to in his retirement, he jokingly replied, “I am looking forward to spending more time at my second home at the Vaal with my partner Dianne as well as creating more beautiful furniture. Who knows,, they will become valuable pieces of art”. Past President Tommy Stratten (left) handing over the Presential chain and pinning the president lapel to Dr Jan Christoph Hadenfeldt (right). 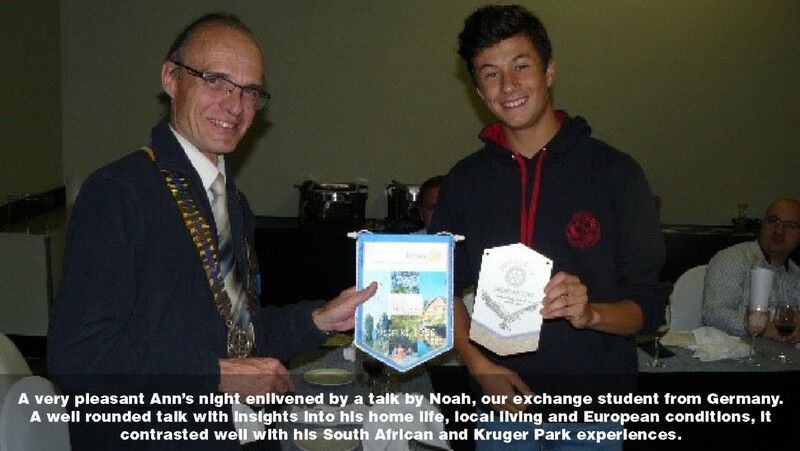 Northcliff Rotary Club recently held it’s Presidential induction and awards evening at the Randpark Golf club. Each year Rotary appoints a new President, from an international to a club level which has ensured Rotary’s sustainably over the last 110 years of it’s existence. 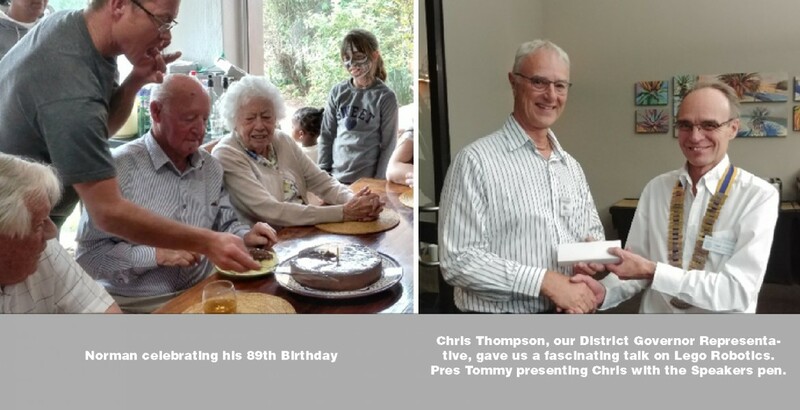 This year is no exception and Dr Jan Christoph Hadenfedt was inducted as the Club’s new president while Ms Coral Stewart was inducted as Ann President. 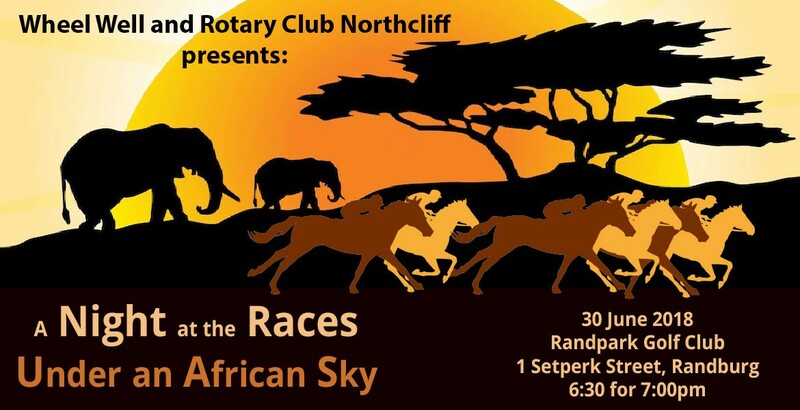 All funds raised are in aid of Rotary Club Northcliff’s projects, Rotary Foundation and Wheel Well. The Northcliff Rotary Club is holding a soiree at St Georges Cathedral, Sherborne Rd, Parktown at 16:00 hrs on Saturday 16 July 2017. In addition to some excellent music, there will be a short explanation of some of the technical aspects of this outstanding Reiger organ which was commissioned in 1912. The event is in aid of the Blanket Drive and entrance is buying and donating a blanket to the Blanket Drive. Tea,coffee and refreshments will be served afterwards. 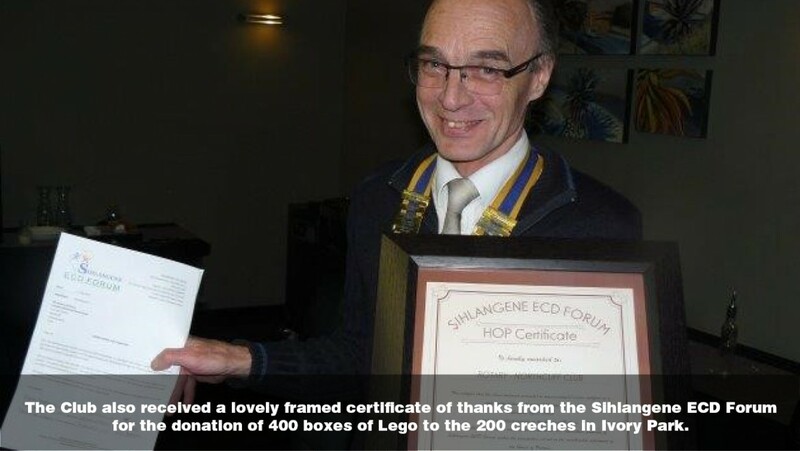 Dr Jan Christoph Hadenfeldt is an accomplished organist and a member of the Northcliff Rotary Club. Details are on the link to the left. We do hope we will see you there. All funds raised are in aid of Rotary Foundation and our community projects. On Friday 15 July, Northcliff Rotary Club Wheelchair Depot handed out 70 wheelchairs received from their partner club Rushmoor Rotary Club in the UK, to Fundisa Multipurpose Skills Centre for disability, who work in Orange Farm, Johannesburg for Mandela Day. At times heart rending but always rewarding to provide mobility ! Kudos to our team Dave Woodhouse, Francis Callard, Ansie Hibberd, Laszlo and Lyn Somody who worked very hard on the day to assist the hand over as people were brought by bus to receive their wheelchairs. This project which started in 1992, has now handed out over 28000 wheelchairs. On Saturday 16 July, we were very fortunate to be able to host a musical soiree at St Georges Church to raise funds for our Rotary Collaborative blanket drive. Well attended by parents from the Deutsche School Johannesburg and Rotarians from Northcliff RC and families, we were treated to a wonderful performance by Dr Jan Christoph Hadenfeldt, one of our own !, who made the Reiger Organ sing ! 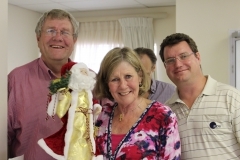 Northcliff Rotary Club proudly welcomes Dr Jenny Roberts as a new member to the team. On the 8th of June 2016 Northcliff Rotary Club proudly welcomed and inducted Dr Jenny Roberts as a new member to our team. Shown here is President Francis Callard "pinning" Jenny's badge and welcoming Her to the club. recently hosted their Annual Primary School Speech Competition. Participating schools included Bryandale Primary School, Bramley Primary School, Bryanston Primary School, Constantia Primary School, Crawford Lonehill, Franklin D Roosevelt Primary School, I R Griffith Primary School, Jeppe Preparatory, Midrand Primary School, Wendywood Primary School and Northcliff Primary School. Valuable Children will be nurtured for a greater destiny and community. Rotary Family Health Days bring free Health Care Services to Communities. 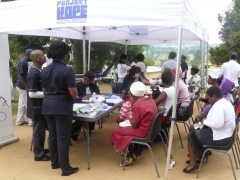 South Africans received free access to health screenings, counselling services, and measles inoculations and polio screening during the Rotary Family Health Days that launched on 2nd April 2014 at the LoveLife Centre, KwaNobhule, Uitenhage, Eastern Cape. 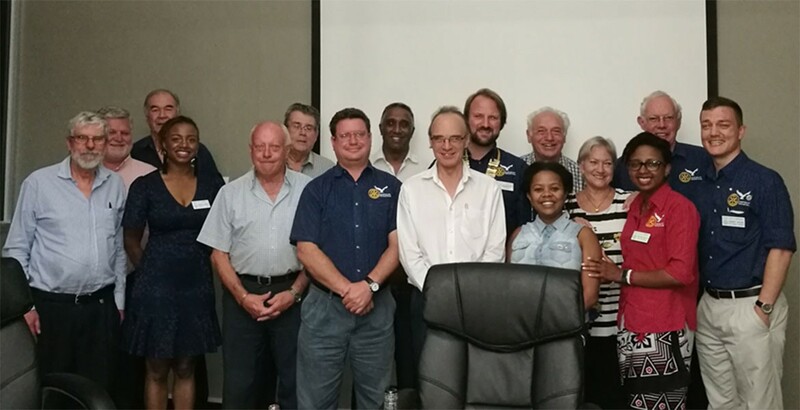 On 29 January the Rotary E-Club of Southern Africa 9400 chartered with 31 members. On Wednesday 4 December, we were all very pleased to induct two new members, Andrew Buttress and Jeanrique Snyman. Andrew ( a BComm(Legal)) is the Office Manager for JAM ( Joint Aid Management) Community Centre based near Zandspruit. Jeanrique is currently editor of Caxton's oldest local paper, Northcliff Melville Times. To date, his work as a journalist and public relations officer has appeared in two national newspaper titles, a daily newspaper, international websites and four local newspapers. On Sunday 12 members of the Club and some family members attended to hand over Christmas goodie bags to the residents. A wonderful morning, greatly appreciated by them.